Playtest #2 was also a success! We had another great playtest on Saturday! Angie, Emily, Becky and Judy joined me for an exciting and stimulating game of Your Planet! This entry was posted in Game Design, Game Psychology and tagged classroom game design, Your Planet on August 16, 2015 by klecser. The game evolves after a play-testing session! Yesterday, three of my colleagues sacrificed a Saturday morning to help me start the play-testing of Your Planet. It far exceeded my expectations. This entry was posted in Game Design, Game Psychology, Uncategorized and tagged classroom game design, Game Psychology, Your Planet on August 9, 2015 by klecser. Over the last few days I’ve managed to nail down some final few things before we play-test Your Planet for the first time. This entry was posted in Game Design and tagged classroom game design, Your Planet on July 28, 2015 by klecser. Many hours and tens of thousands of words of writing have gone into what you see above. I sent out two emails yesterday to recruit playtesters from amongst my education colleagues (one content and one curriculum group). Now all I really need to do is send out Doodle polls to schedule them and find the physical action points, comments and question tokens. This entry was posted in Game Design and tagged classroom game design on July 14, 2015 by klecser. Yesterday was one of the most productive days for Your Planet! 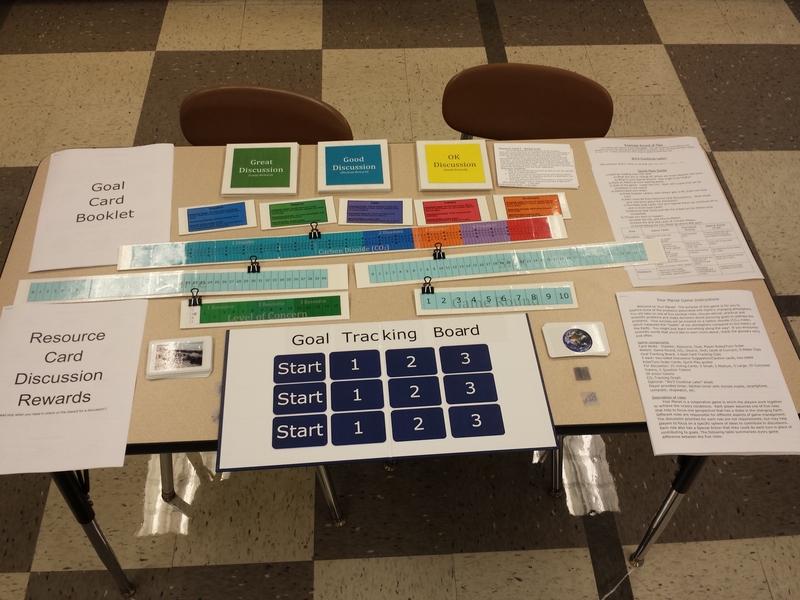 This entry was posted in Game Design and tagged classroom game design on July 8, 2015 by klecser. I started off today with some writing on Resource cards and Disaster cards. Writing was easy today because I had solved one of the great “problems” of the game this morning. This entry was posted in Game Design and tagged classroom game design on July 6, 2015 by klecser. Yesterday was another strong day of work on Your Planet (My tentative name for the global climate change game)! This entry was posted in Game Design and tagged classroom game design on July 1, 2015 by klecser.